Fort Macleod Citizen of the Year Jim Farmer. Fort Macleod’s Citizen of the Year is Jim Farmer. Accepting the award from the Chamber of Commerce, Farmer acknowledged the other nominees, Cathy Dietrich, Jeff Murphy, the O’Sullivan Family, Wes Stockton, Debbie Sutley and Andrew Walmsley. “It’s a joy to be part of this town,” said Farmer, accepting the award from outgoing Chamber president Becky Housenga, who was earlier presented flowers and a gavel for her service. The award was presented at a gala event at the Fort Macleod and District Community Hall. Farmer’s list of community volunteerism is long, including 20 years on the fire department, service with Fort Macleod search and rescue, as a foster parent, minor hockey coach, and initiating the Teddy Bear Program in his EMT role to comfort patients. Rebecca Runions is Fort Macleod’s Junior Citizen of the Year. The F.P. Walshe school valedictorian was chosen for being a positive role model to those around her, sharing her musical and theatrical talents with the community, and for her notable hard work and dedication. Runions’ fellow nominees were Grayson Archibald, Darian Atwood, Chelsie Harris, Nic Housenga, Alisha Larson and Tiegan Trotter. The winner of the Outstanding Business Award was Vanee Trucking. The Saturday evening awards night was a well-attended event at the Fort Macleod and District Community Hall, catered by M & A Catering, who won the 2018 Home Based Business Award. Other award winners included Front Line Towing, accepting the New Business Award, and Weston Manufacturing winning the Small Business Award. Suzy Magallanes of ATB Financial received the Employee Service Award, and Ken Harris and staff at Fort Pharmacy won the Customer Service Award. Davis Dodge was the recipient of Large Business Award, and DeKok Forage Producers earned the Agricultural Business Award. Market on Main received the Community Enhancement Award, with Mackenzie Hengerer, Sonya Brobbel, Korine Kreft, and Naomi Faulkner accepting. 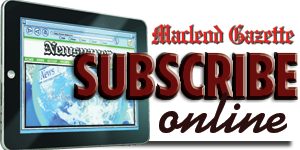 Fort Macleod Mayor Brent Feyter noted the Fort Macleod Chamber of Commerce now has more than 100 members. “That is pretty amazing when you think of some of the past struggles we’ve had,” Feyter said. Ricky Sharma, general manager of Davis Dodge, the sponsor of the small business award, told the crowd starting a business is scary, but Fort Macleod is the right place. “I tell people in Fort Macleod you are surrounded by the greatest people and they will help you succeed,” Sharma said.